The writer becomes the story when crime reporter Mia Hale is discovered on a Jacksonville beach, bloodied and disoriented, but alive. She remembers nothing, but her wounds bear the signature of a sadistic serial killer. After years lying dormant, The Collector has resumed his grim hobby: abducting women and taking gruesome souvenirs before dumping their bodies. But none of his victims has ever escaped and he wants Mia back, more than he ever wanted any of the others. FBI agent Eric MacFarlane has pursued The Collector for a long time. The case runs deep in his veins, bordering on obsession and Mia holds the key. She'll risk everything to recover her memory and bring the madman to justice, and Eric swears to protect this fierce, fragile survivor. But The Collector will not be denied. In his mind, he knows just how their story ends. The last in the Chasing Evil trilogy, and quite a lot more enjoyable than I had expected. After reading the two before, I had surmised that maybe I should space out my romantic suspense appetites between several other books (unless I'm looking for an extended romantic suspense fix, which is probably exactly what happened). 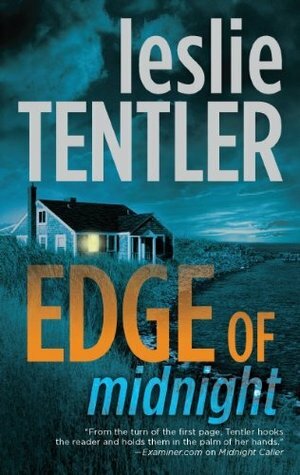 Leslie Tentler's formulaic story progression became rather predictable by the second book, so I knew what to expect for Edge of Midnight. It's not a monotonous feel, but it still kind of bursts your excitement bubble when you already have an idea what's going down in this crime thriller. And also, is it still okay to call it a mystery when the serial murderer is presented to us six chapters into the book? Despite that, however, I found that I liked this last book a lot more than I had liked the first two. For whatever reason, I was actually caught at the edge of my seat, feeling more suspense for the characters and more excitement for the developments than I had for the first two books. Strange, no? Well, it's not like I'm complaining much since I love a good romantic suspense any day. Despite the solid writing, it doesn't escape my notice how "damsel-in-distress" oriented these books tended to be. Not that it's a completely bad thing, I guess. The women in these books aren't exactly weak or TSTL, and they can take care of themselves just fine, but it still feels like a lot of times they just keep running into life-threatening danger and need to be saved. That, or they seem to be sitting bait for the culprit to pluck them out of safety just to land in a torture chamber (again, needing to be saved by an FBI Knight in a Nice Suit who usually has a death wish for some reason). Which makes me wonder about this: Whenever women do stupid things and walk into danger knowing that they could get themselves killed, they are deemed TSTL. When men do the same thing in these books (walking right into a situation they that they know will end up killing them), they are considered heroes. What's up with that? Shouldn't TSTL be applicable to both genders? Correct me if I'm wrong. I probably haven't read nearly enough romantic suspense books (yeah, right) to be a good judge of this, but it kind of stands out. I guess it's all part of the excitement? But anyway... Apparently these issues aren't enough for me to keep away anyway. The Chasing Evil Trilogy is part of my 2014 Series Challenge.